SOUTHINGTON - Jacob Drena isn’t a fan when one his of teammates gets overlooked, especially one that has been playing at a high level. That’s why after Wednesday night’s Apple Valley Classic win over rival Cheshire - the Southington football team’s seventh in a row over the Rams - the senior signal caller made sure to tell reporters how important running back Tanner LaRosa has been to the Blue Knights’ success. LaRosa has become, and perhaps a little too quietly for some of his teammates, one of Southington’s best players on offense. Against Cheshire, the senior tailback ran for 143 yards and two touchdowns to be named the game’s overall MVP. It was the fourth time this season LaRosa has rushed for 120 yards and two touchdowns or more. Since the mid-season bye week, he’s run for 625 yards and nine scores. That’s perhaps been the biggest aspect in helping LaRosa during a season in which he is just 54 yards from the 1,000-yard mark - he currently has 946 yards - and will most likely get during Tuesday’s playoff game against Fairfield Prep. There’s also the fact that he averages 6.7 yards per carry and has a team-high 14 total touchdowns. Last year, LaRosa was thrust into the starting role after the team’s No. 1 running back, Brandon Kohl, went down with a torn ACL on the first drive of the first game. LaRosa finished with just 390 yards (3.8 yards per carry) and didn’t have a single game with 100 yards, despite finding the end zone nine times. It’s also helped that the running back has been able to play and learn behind some record-setters at Southington. Watching and listening at first can be just as important as on-the-field reps.
Upham ran for 1,950 yards and 25 touchdowns on 223 carries his senior season as the Blue Knights went to finish with a 12-1 record. 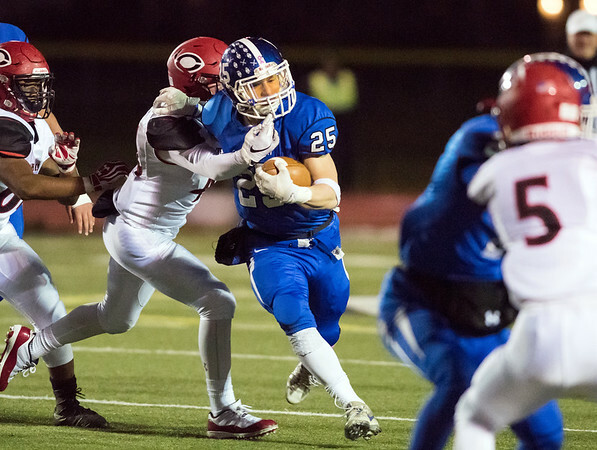 And while it may have taken a little bit for LaRosa and his offensive line to hit their stride, having a potent running game is often when Southington is at its best. And as LaRosa’s quarterback pointed out, perhaps it time for people to start noticing the player that wears No. 25 more than they have been. Posted in New Britain Herald, Southington on Sunday, 25 November 2018 19:07. Updated: Sunday, 25 November 2018 19:09.